I’m very excited. Turns out this October will by my busiest October in the history of my business. It also means that the steps I’ve taken in the last few months are working. It’s not easy to have to rebuild your business when you realize that what you’ve been doing for a long time isn’t working. But I faced reality, started making positive changes and the results are showing themselves. What do I have in store for October? Well, I’m doing two different shows. 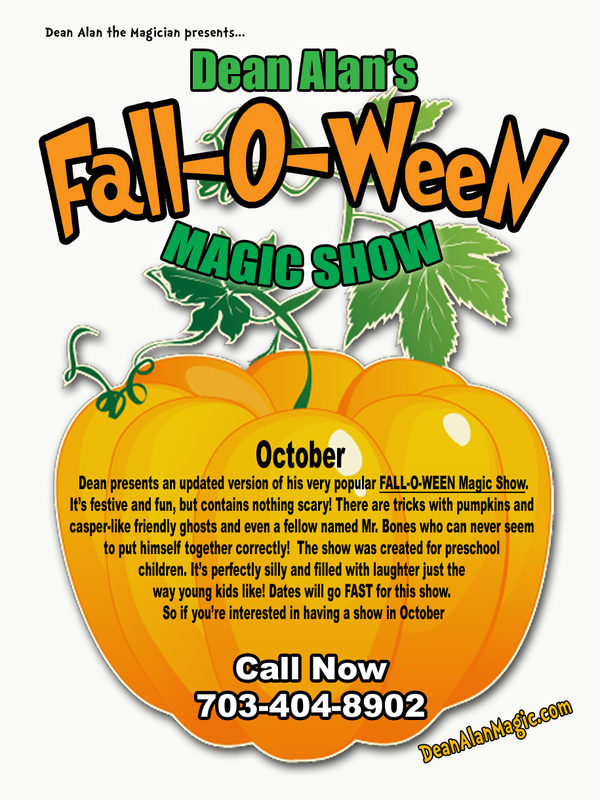 The one main show is my Fall-O-Ween Magic Show. It’s a fun Halloween show without scary stuff. I new feature this year will be The Great Pumpkin ( he is still being worked on currently). He is a puppet of sorts, kind of a mix between a scarecrow, pumpkin, and zombie. He will have a really fun personality, and then do something very magical! I’m sure people will enjoy him. There are other new things in the show too, but I don’t want to give away all the surprises. 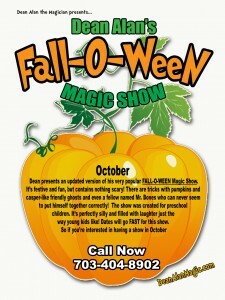 The other show I’m doing is The Very Spooktacular Magic Show, though that falls under the ‘Dean Alan Carnegie’ shows. What does that mean? It means it’s not designed to focus on daycare aged kids, but rather a general family audience. And the feature of the show will be sawing a kid in half! Now, if I can’t locate a suitable kid, I may saw a parent in half…..all in good fun of course. AND, as of today, Oct 1, 2015, I just found out that Halloween Day has opened up. I was supposed to be doing The Houdini Festival in Danville VA, but I got word from the producer that he has to postpone the event until next Spring. So Halloween is open, if you want it! October 1, 2015 in Blog.